By Jefferson Litten for the Community Environmental Council | Published on 04.08.2014 12:38 p.m.
From his parents, Gilbert Robledo inherited the ethic of living with a small footprint. In their Santa Barbara Mesa backyard, Robledo’s parents planted a large garden and a small fruit orchard so they would no longer have to buy fruits and vegetables shipped from hundreds of miles away. Robledo fondly remembers childhood meals cooked with homegrown vegetables. Robledo and his wife, Joy, have since inherited the home and continue to manage it sustainably. They still tend the garden and fruit trees, maintain three compost bins, run an energy-efficient home and consider the environment in all of their decisions. 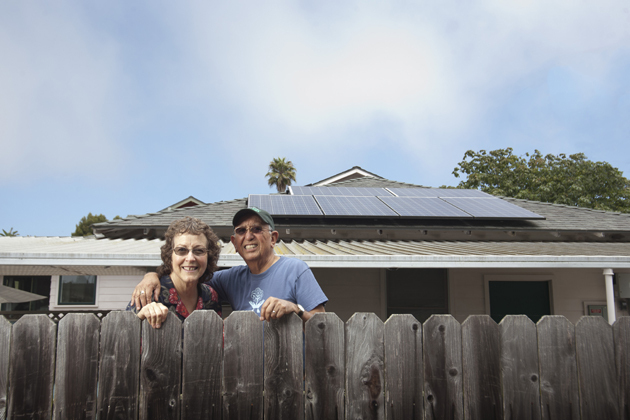 Adding solar panels to the home naturally appealed to the the couple’s environmental mindset, but when they first looked at solar they found it too pricey. Several years later, when the Robledos heard about discounted pricing through the Community Environmental Council’s Solarize Santa Barbara program, the timing and the price were finally right. Gilbert Robledo had recently seen an intriguing video about a New Jersey gentlemen who was “driving on sunshine” — powering his electric vehicle with electricity from solar panels on his home — so when they met with their solar consultant, the Robledos designed a system capable of powering both their home and an electric vehicle.